If you need to return your items to John Lewis whether it is because it is the wrong item, it is damaged, it is the wrong size or for any other reason, you can follow the guide below to find out the different ways you can return your item to John Lewis. If you’re returning your John Lewis item because it is unwanted, it needs to be in the original unused condition. You have 35 days to return an unwanted item and you will your proof of purchase. If you are returning a gift you have received (you must do this in-store) you will need to bring a gift receipt or despatch note, you will either be able to exchange it or receive a refund as a gift card. If you are returning your item because it is faulty or broken you need to call 0843 178 5761 to report this to the customer service team. If the issue developed within 30 days of purchase you will be able to exchange it or receive a refund, if it has been more than 30 days John Lewis will repair it as long as it is within the warranty and complies with terms and conditions. 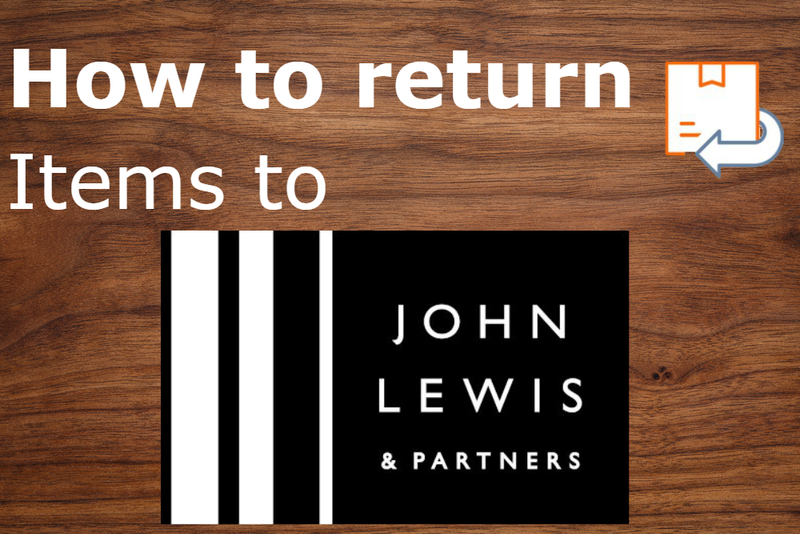 You can return an item you bought online or in-store to a John Lewis & partners shop, this includes some Waitrose&partners stores (this is only for online orders), you can find out where you can return your item to by calling the number above or by going to the John Lewis website. You will need to bring with you proof of purchase which can be a receipt or a dispatch note included in the package your items were delivered in. The price of your items will be refunded in full to the original purchaser of the goods, it can take up to 5 days for the bank transfer to show in your account. If you would like to return your items purchased online via the post you will need to print out your pre-paid returns label which you can do by going onto the John Lewis website and accessing the correct link via your account. You then need to fill out the return form and place it inside of the package, attach the pre-paid label to the front of your package and seal the package. You then just need to take it to your local Royal Mail post office and you should receive your refund within 14 days if you do not then you should call the number listed above. You can return items you have bought online by using MyHermes. You just need to fill out the return note which can be found on the front of your delivery note, packaging your items back into the original packaging with the note inside and removing your address from the front of the package. You can then go onto the John Lewis website to organise for MyHermes to collect the parcel from your home or find out where you can take your package to. To return your John Lewis item via Collect+ you first need to fill out the return section of your delivery note which can be found inside your package. Remove your address from the front of your parcel and attach the Collect+ label. Repackage your parcel with the delivery note secured inside. You then just need to take your package to your local Collect+ located which you can find on the John Lewis website. If your item weighs over 15kg or was delivered to your home by two people you will only be able to return your item to John Lewis via home collection. You can organise your home collection by calling the John Lewis team on 0843 178 5761 and informing them that you need to organise a home collection to return your item. There is a charge of £29.95 for home collection but if you are returning your item as it is faulty or damaged you will not have to pay the charge. You should receive your refund within 14 days.